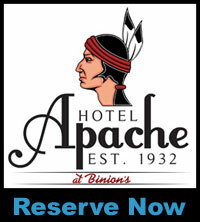 The Hotel Apache was originally opened by the Silvagni family in 1929. The family came to Las Vegas as a cement contractor for the Hoover Dam project and realized the workers needed a place to get away from their work and the heat of the desert. It was the first in Las Vegas to air-condition its hotel lobby and have air curtains at the entrance to the hotel. The hotel was eventually acquired by Benny Binion and was the place to stay for many Hollywood movie stars like Clark Gable, Humphrey Bogart and Lucille Ball. It was also the first in Las Vegas with an electrically operated elevator, fully carpeted casino and made poker a mainstream casino game. Over the course of over 90 years, the historic Hotel Apache and Binion's Gambling Hall have had many reports of spirited guests in residence who make it clear that the Hotel Apache and Binion's Gambling Hall still belong to them. Several employees have been touched, nudged, report sightings of figures; and ghost hunters have reported high levels on their EMF meters and motion sensors along with mediums seeing actual images of past owners' family members. 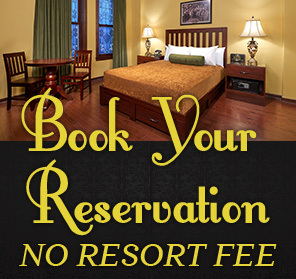 Book your next stay at the Historic Haunted Hotel Apache and let us know what you experience.